Full disclosure: I own this printer. I bought it recently though; I’m doing this review early in my ownership so that it’s as fair as possible. Other printers reviewed won’t have the benefit of months of tinkering, so neither will this one. And this one is the Rostock BI V1 produced by Boots Industries. 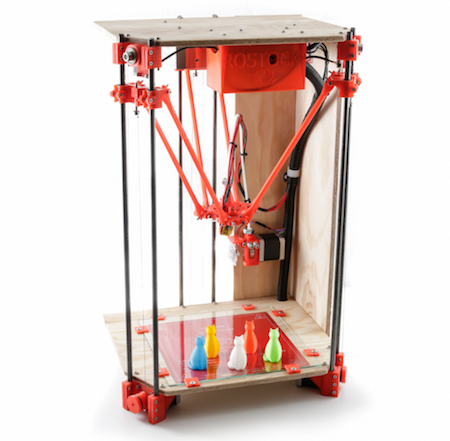 It’s a delta style 3D printer based on the original Rostock prototype designed by Johann Rocholl in 2012. After someone from the company contacted us about adding the printer to our directory, I decided to add it to my desktop. Ever since I saw Johann’s prototype video I’ve wanted a delta printer. The motion is just entrancing. Though the cartesian arrangement that most 3D printers use is time tested and refined, I like the simplicity of the delta. All of the torque goes in the same direction, vertically, so rigidity of the frame isn’t quite as important. The bed is fixed so leveling is less frequent. Deltas also have better build volume to footprint ratios, producing larger prints while occupying less space on the desktop. The Make Torture Test was printed at 150 microns at moderate speeds of 40mm/s. The print hasn’t been cleaned. It was printed without supports or brim, so that arch is quite an achievement. The square overhang in front of the arch did well too, though it can’t be seen in the picture. There was very little stringing between the pillars, and you can see through all the holes from the top. The only issues are roughish corners and a few dots, which would both likely be improved by increasing retraction. This was one of the first prints and I hadn’t tweaked retraction yet. The test cube demonstrates dimensional accuracy, where the cube is supposed to be 10 millimeters on all sides. That’s pretty close being within 20 microns. Stanford Bunny was printed at 100 microns and came out nearly flawless. It’s cute in green. The 3D Knot was recommended by a commenter on my TAZ review to test retraction. It did well at 200 microns. There were two strings down in the middle, but otherwise only a couple dots. Owl Statue looks simple but actually tests overhang fairly strenuously. There are some minor imperfections on the lower feather tips and the beak. Printed at 150 microns 60% scaled. One of the most popular objects to print is the vase. I did the Scripted Ribbon Vase at 250 microns with the spiral vase feature in slic3r. This took an hour and a half to print at full size. Too really test the capabilities of the BI I printed the Treefrog at 70 microns. This was also printed early on before I adjusted retraction and there are some issues on the leg, but it’s quite smooth everywhere else. No printer review is complete without a Yoda. This a serious overhang test with the chin and ears, and the BI managed decently at 150 microns. Overall I’m pleased with the printer and the filament. My complaints are few: though the printer’s components are printed, I can’t reproduce the arms because they’re too big for the build volume. The Bowden extruder system needs a bit more refinement because the filament is under quite a bit of pressure and can snap on prints with a lot of retraction if the tension is too tight. The fan on the hot end can hit the extruder if the platform is homed while near the extruder. On a related note, telling the X or Y axis to home doesn’t end well as there’s nothing to stop the arms from going beyond geometric limitations except physical limitations. The filament is fairly translucent, which makes layers more visible and changes from one perimeter to two noticeable. The red is almost pink. The translucency is great for vases though, especially when using lights. It’s good filament if you want shiny prints. Prints stick well to the heated glass bed and come off easily. The printer is quite fast, though I haven’t really pushed it yet. I’ll get around to it. After a bit of slice adjustments almost every print is successful. But this is V1, which is sold out. Jean and Francois are working on V2 now, which they’ll be crowdfunding soon. It will be improved in several ways, but what I’m most looking forward to is auto-leveling.